There are several ways to “feel “ Naples, and one of the most attractive ones is without any doubt the walking down into the underground. There’s a real “parallel town” underneath, which was dug-out through the centuries into the tufa rock for chilometers and chilometers and got developed together with the one on the surface, creating a connection between the world of the light and the one of the darkness, in a neverending dialogue with the death. All the alleyways, the courtyards, the crypts, even the sewer of the regular town were considered to be “legal gates” opening towards the hereafter, so that the neapolitan underground became the border between the two different worlds. The relationship between the two worlds is still recognizable by visiting the old town: the sacred atmosphere of the top, due to the presence of hundreds of catholic churches, is strictly related to the profane underworld, where the cult of the “souls of the purgatory” is still followed by thousands of citizens. The building of the church was financed by a confraternity of noblemen, founded in 1604, who originally collected alms for celebrating masses for the soul of the dead. They collected so much money to build even a church, planned by Cosimo Fanzago, whose works began in the 1650’s and ended in the following century. 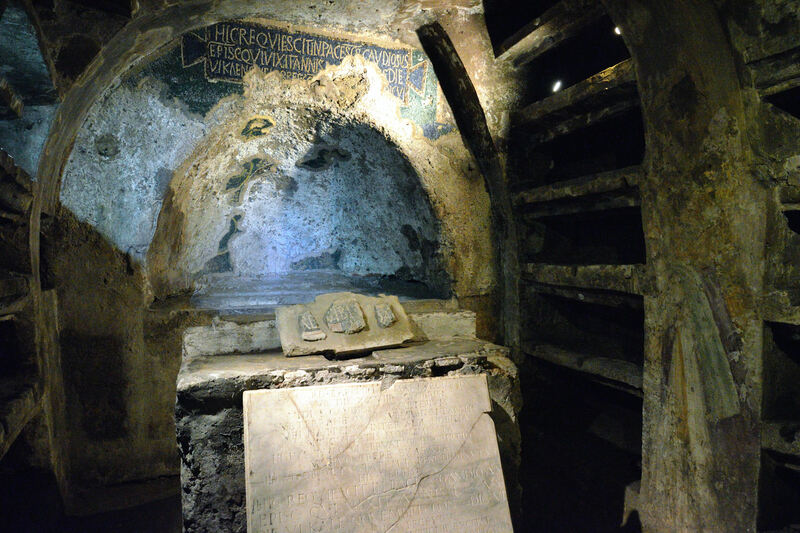 Underneath the church, the hypogeum still contains several venerated bones and skulls. The souls that were worshipped were those of un-known people, who were considered intermediaries between the mortal and the divine. Souls were worshipped not just at Purgatorio ad Arco, but also in the cemetery of Fontanelle. 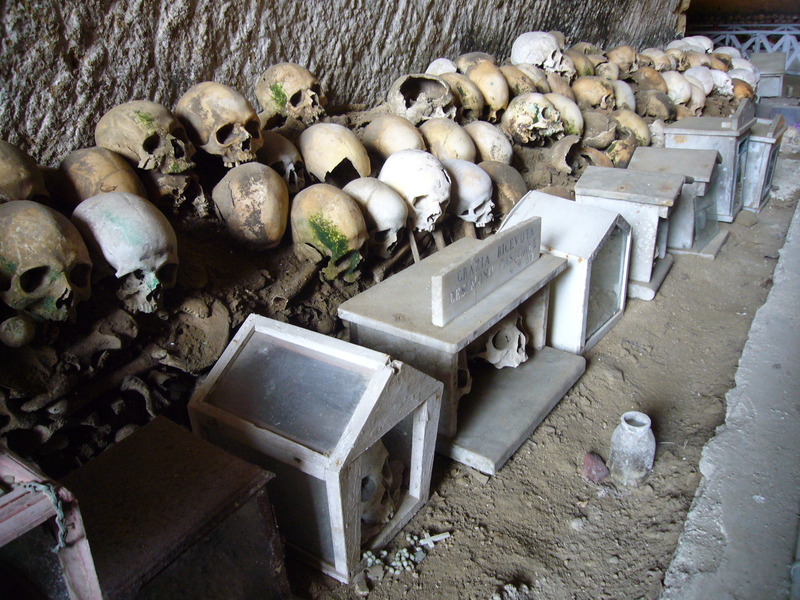 The Fontanelle cemetery is an ossuary located in the Materdei district of Naples. The district used to be located outside of the city walls, which was the only place where a cemetery could be built during the 16th century. Many Neapolitans, however, insisted on being buried in their local churches but, since the place was not sufficient to everybody, they slowly removed earlier remains from the churches to the cemetery. 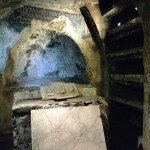 Several anonymous remains were collected into the cemetery during the plague of the 17th century, so that the cave became the unofficial final resting place for the less well-to do of the city. The last great “deposit” of the indigent dead seems to have been during the cholera epidemic of 1837. A spontaneous cult of devotion to the remains of these unnamed dead developed through the neapolitan citizens during last century, thank to their chatolic education. They want to help the ones who had no proper burial, so that they “adopt” one of the skulls in the cemetery by bringing him flowers, candles and by praying for his soul to get to the paradise. In 1969, Cardinal Ursi of Naples thought that such devotion had degenerated into fetishism and ordered the cemetery to be closed. The faithfuls, anyway, recently asked and obtained the re-opening of the site. A visit to the spectacular baroque San Severo Chapel is not to miss. 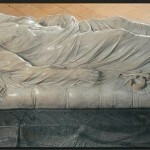 The masterpiece is to be found in the statue of the Veiled Christ by Giuseppe Sammartino, a real example of virtuosity in sculptoring marble; besides, many inventions and anatomical machines are visible in the chapel, all underlining the interest and the involvement of its owner, the prince of Sansevero, in alchemy and Freemasonry. The San Gaudioso Catacombs are situated beneath the presbytery and the apse of the church of Santa Maria della Sanita. Legend has it that after having been deprived of everything by the vandal, King Genserico, the saint, together with many other religious people was forced onto a boat and abandoned at sea. God then set them ashore in Naples where the saint and his companions founded a monastery. The skeleton used to be painted on the wall along with some symbolic object indicating either the status or the profession of the deceased.